Fall temperatures have finally arrived, and with them a reminder that the ever-changing weather calls for a versatile and well-cut topper. While it’s too early to break out your parka (don’t worry, you’ll have plenty of time to wear that soon), a lighter weight, transitional jacket will keep you fashionably covered without weighing you down. This season, there are plenty of covetable options in stores that that fit the bill, from updated wool classics to runway-inspired styles that will adapt with the weather. Trench coats are a seasonal staple (light enough to keep you from overheating but functional enough to weather a rainstorm), but they can also feel a bit expected. Luckily, designers have been mixing things up by playing with pattern and proportion. The longer length, cropped sleeves, and houndstooth pattern of this double-breasted coat make it a standout pick. Khaite Charlotte trench coat, available at TNT Woman. For those looking to add some edge to their fall wardrobe, this waxed-cotton jacket has just the right amount of rugged appeal, but it still feels modern thanks to a slim and stylish cut that doesn’t skimp on functionality. And if you want to wear it well into the season, invest in the matching removable quilted waistcoat to beat the chill. 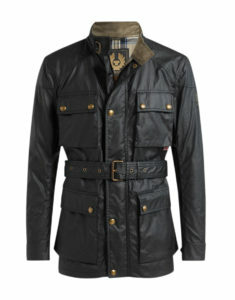 Belstaff Roadmaster men’s jacket, available at Belstaff. A sure-fire way to keep your spirits up as the leaves start to fall is with a brightly-coloured topper. This chartreuse jacket is eye-catching and unexpected, with a cropped hem and sleeves that will look perfect worn over an oversized button-up shirt while it’s still (relatively) warm, or with a chunky knit sweater when the temperature drops. 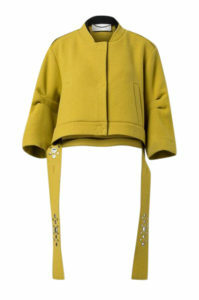 Dorothee Schumacher Enticing Rebel jacket, available at Andrews. Suede outerwear has made a comeback in menswear, and fall is the ideal time to take it for a spin. Cut like a jean jacket, this version walks the line between luxe and casual, and comes with a removable shearling collar for a dash of style and added warmth once winter sets in. 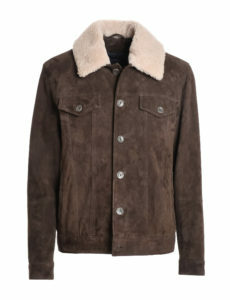 Eleventy suede and shearling men’s jacket, available at Eleventy. Patterns can sometimes feel too tied to a particular season, so when you’re looking for a printed coat you’ll be able to sport throughout the year, choose one that designers come back to time and time again: leopard. It’s punchy enough to liven up solid colours yet neutral enough to play well with other patterns, and will look just as fresh on the first day of fall as on the last. What’s not to love? 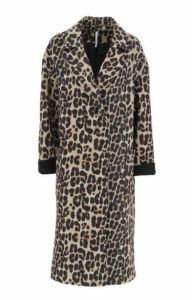 Imperial Fashion Marjorie maxi coat, available at Maska. Menswear tends towards the traditional, but every so often a new idea shakes things up. For Fall/Winter 2018, the fireman jacket has made its way into high fashion. This version avoids being too literal, and is perfect for making it through rain and wind unscathed. The colour and fit are contemporary, but key design details, such as reflective tape and waterproof fabric, give a nod to traditional firefighting uniforms. 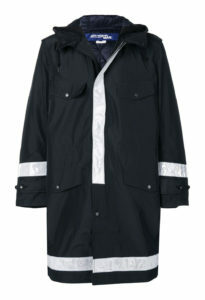 Junya Watanabe MAN men’s raincoat, available at TNT Man. Dressing for the cold doesn’t mean having to look any less professional or stylish. 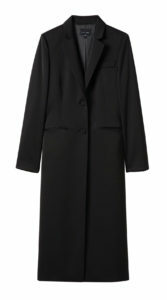 Simply slip this coat over a suit when your blazer isn’t keeping you adequately warm anymore. Sleek and tailored, it looks just as polished worn open as it does buttoned-up with a scarf and gloves. Judith & Charles Parma jacket, available at Judith & Charles.